Vladimir Smutny, Pavel Krsek and Pavel Pisa (from the Department of Control Engineering) developed, in collaboration with Neovision s.r.o., a mobile robot for air duct cleaning by dry ice blasting. 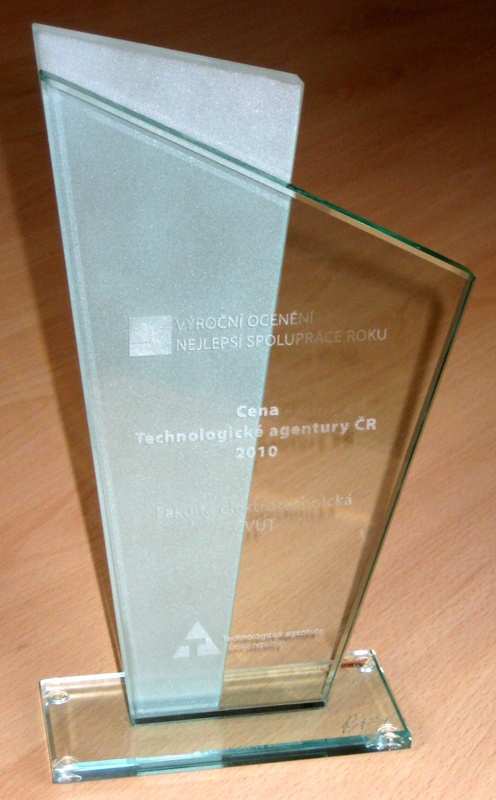 The project received third place in the Cooperation of the year 2010 competition organized by the American Chamber of Commerce (AmCham) and the Association for Foreign Investment (AFI) The robot was also awarded a special prize by the Technology Agency of the Czech Republic. 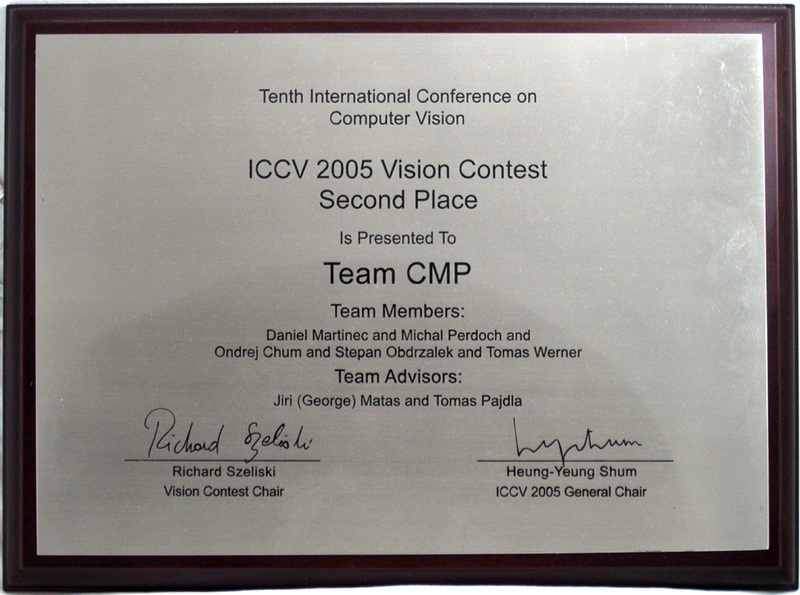 Lukas Zich's's diploma thesis Lukas 's diploma thesis Control of Computer by Head Movements supervised by M. Urban and J. Matas won the Master these of year 2009 in Informatics award in the medical information technology category. Download a trail version of the software for mouse (cursor) control by head movement (links point to pages in Czech). 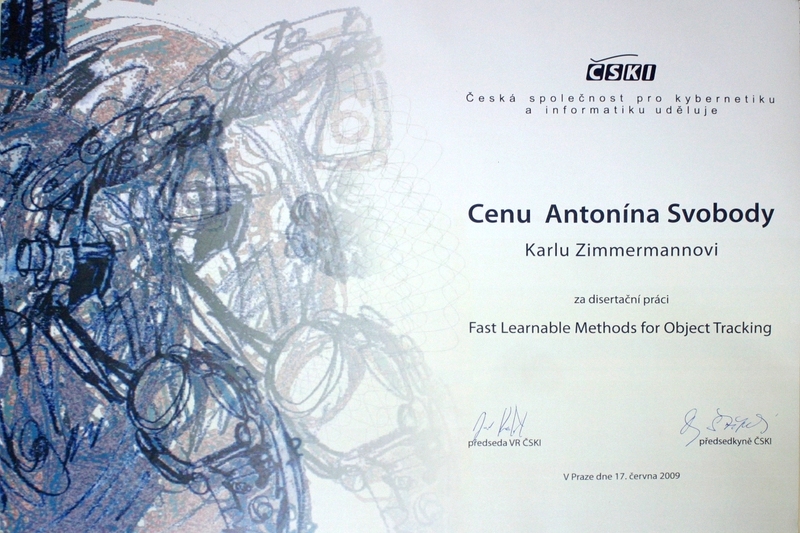 CSKI prize for the best PhD work in 2008: Karel Zimmermann's PhD thesis Fast Learnable Methods for Object Tracking, co-supervised by Jiri Matas and Tomas Svoboda, was awarded the Antonin Svoboda prize for the best PhD dissertation in the Czech Republic in the field of cybernetics and informatics in 2008. 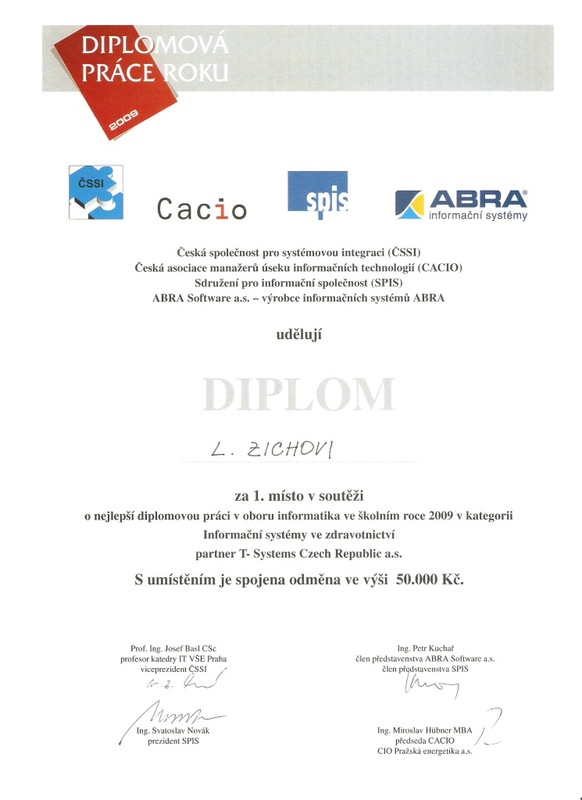 The prize was awarded by the Czech Society for Cybernetics and Informatics (CSKI). Look at a demo page with details and accompanied publications. 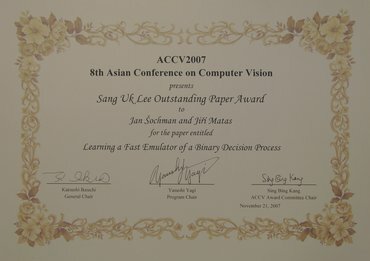 Best Paper Prize to J. Sochman and J. Matas for paper Learning A Fast Emulator of a Binary Decision Process , [PDF, 1 MB], [PPT, 4 MB], Tokyo, Japan, 2007. Doctorandus Prize 2006 for the most innovative PhD work was awarded to Stepan Obdrzalek for developing a real-time object recognition method exploiting the so-called decision-measurement tree. 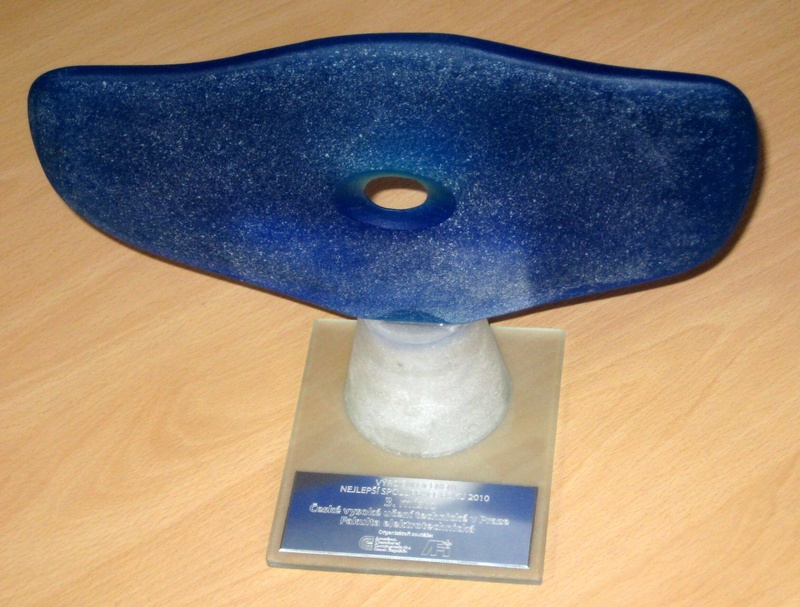 The prize is awarded by the Ceska Hlava foundation, Prague 2006. Second place of the CMP Team for their 3D location estimation from uncalibrated 2D images, Beijing 2005. 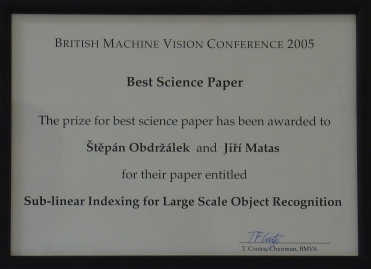 Best Science Paper Prize to S. Obdrzalek and J. Matas for paper Sub-linear Indexing for Large Scale Object Recognition, [pdf], Oxford 2005. 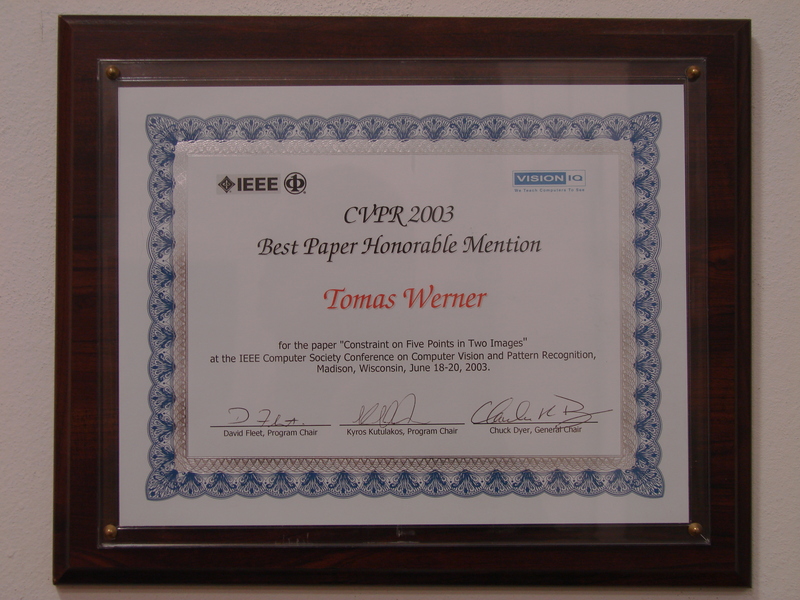 Best Paper Honourable Mention to T. Werner for paper Constraint on Five Points in Two Images [pdf], Madison 2003. 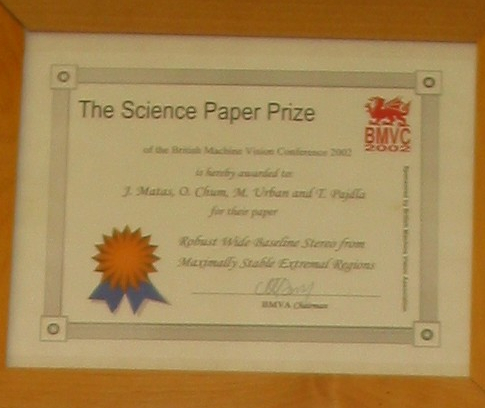 Best Science Paper Prize to J. Matas, M. Urban, O. 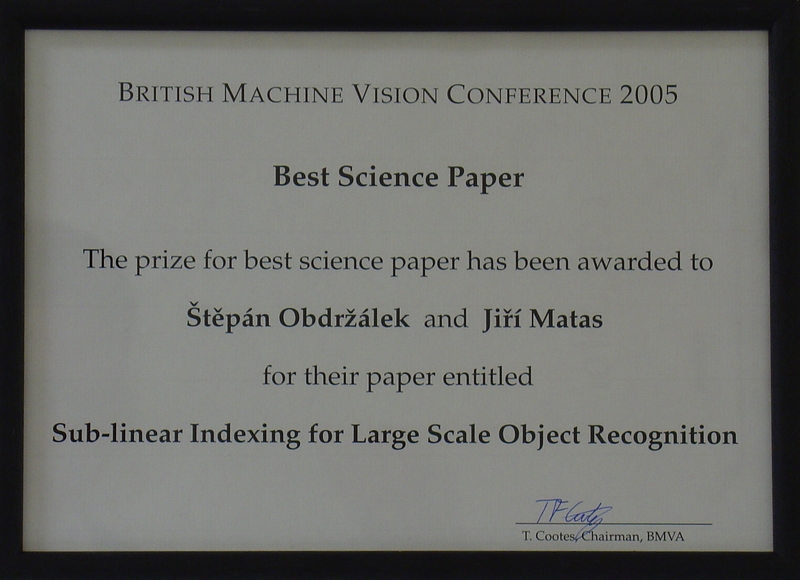 Chum and T. Pajdla for paper Robust Wide baseline Stereo from Maximally Stable Extremal Regions [pdf], Cardiff 2002. 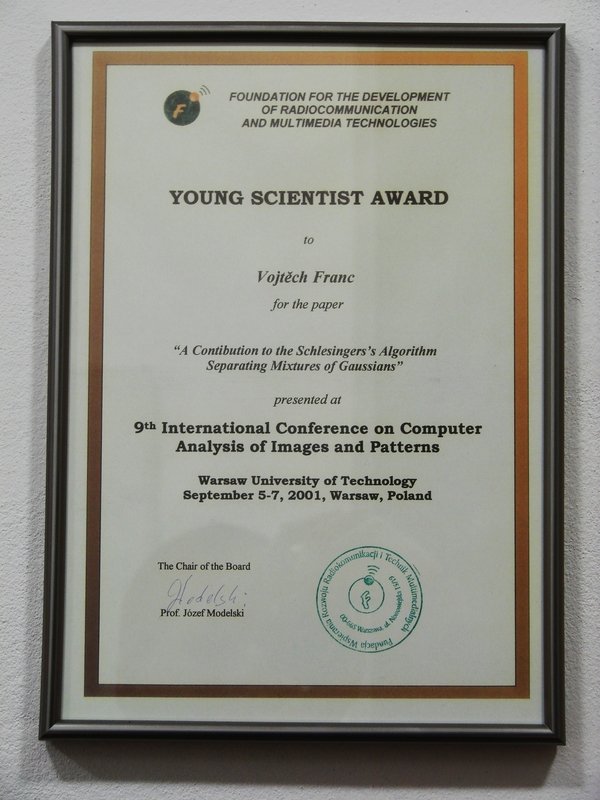 Young Scientist Award to V. Franc for paper A Contribution to the Schlesinger's Algorithm Separating Mixtures of Gaussians, Warsaw 2001.